Not everybody like to eat cakes, especially those who have aversion to sugar and is on a strict diet. But nobody mind having on their birthday and a birthday party isn’t complete without a cake. What can we do? 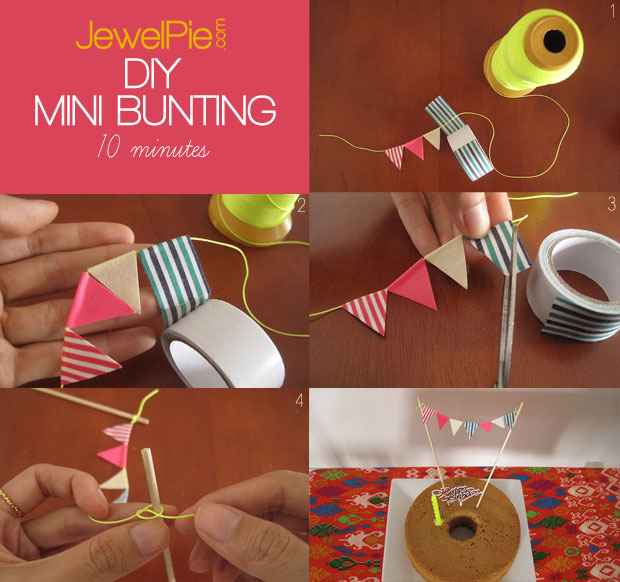 Add a DIY mini bunting to something light like a chiffon cake. This easy craft would only take 10 minutes. 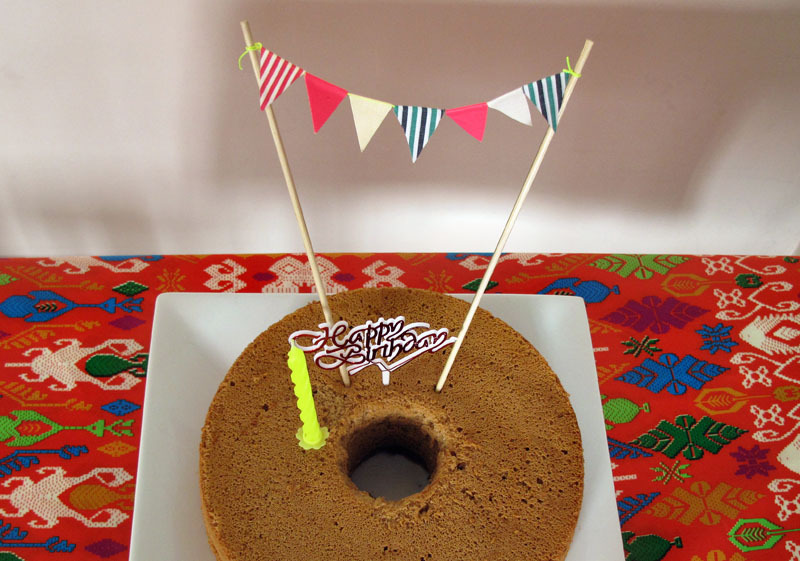 Chiffon cake is light and not too sweet. You can also buy other replacement like bread, donuts or muffins. Any tapes will do. Try to find bright colours and print patterns to make it more fun. 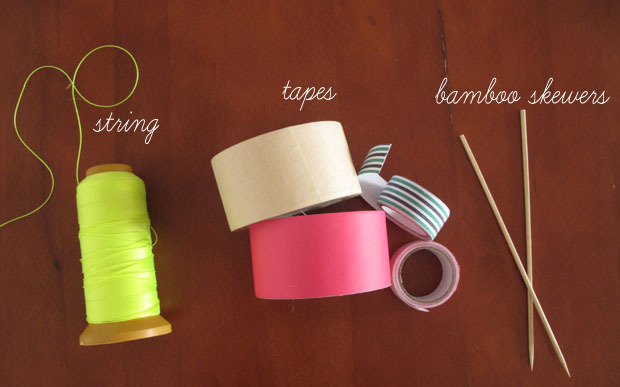 From all the tutorials we’ve seen on Pinterest, washi tape is a popular choice due to its variety of pattern. However, they are rather pricey. I find that duct tapes, masking and fabric tapes works well too. 1. 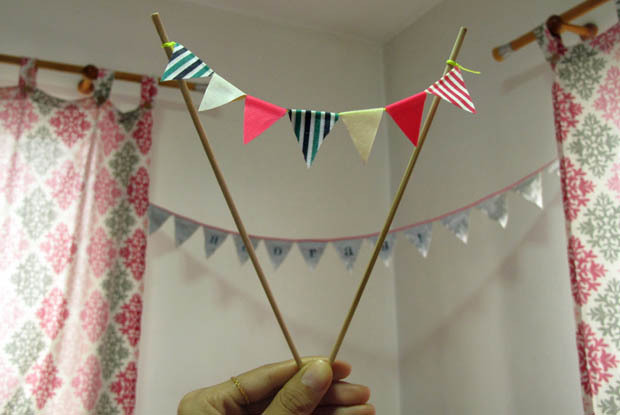 Cut a string Decide how long you want the bunting to be and cut the string accordingly. We use twice the diameter of the cake. 2. Stick tapes onto string Pull out a tape and stick the middle part to the string. Don’t start at the beginning for the string. You will need to tie the ends around the skewers. 3. Cut tapes into triangle Using a sharp scissors, cut tapes into triangle. If you use tapes with bigger width, you will have to cut it smaller before sticking it onto the string. 4. Tie string on skewers Tie both en of the string onto the non-pointy end of the bamboo skewer. 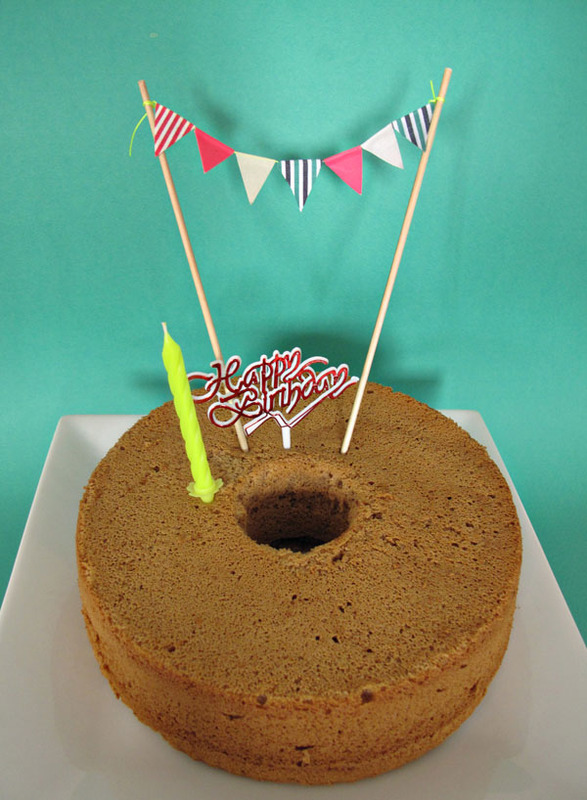 Now you’re ready to decorate your cake! This chiffon cake with mini bunting was made for my aunt, a woman who turned her balcony into an edible garden with plants like pumpkin and basil, borrow heaps of cookbooks from the library and wake up at 5 am everyday to do qi gong. She loved it. Do you know anyone who dislike sweet cakes?